A (Mostly) Brief History of the SAT and ACT Tests by Erik Jacobsen is licensed under a Creative Commons Attribution-ShareAlike 4.0 International License. I've never done any kind of search engine optimization for this content. However, I do want it to render properly in order that you see it the way I see it, so I've made sure that the HTML 4.01 within is free of errors. This page was last updated on: 2019-04-13. By the end of the 19th century, tests for admission to U.S. colleges are specific to each school. (The arithmetic portion of Harvard's 1869 entrance exam can be seen here. The corresponding portion of MIT's 1869 exam can be seen here. These portions of the two tests are quite different in difficulty.) The content of the tests varies widely and can be highly dependent on the interests of the faculty conducting the exams. It is not unusual for a college to administer exams on campus a week or two before classes begin. As an alternative to testing, many colleges, especially in the midwestern U.S., use "admission by certificate": a high school would be certified by inspectors from the colleges to have an appropriately preparatory curriculum for college work, and students graduated from such a high school would be considered to be adequate without testing. By 1900, however, inspections are infrequent and college faculty are often not present. 1899 The College Entrance Examination Board (or "College Board") is founded in December, consisting of a non-profit membership of twelve colleges and universities. The membership is comprised mostly of elite institutions in the northeastern U.S., including Columbia, Cornell, Vassar, Barnard, and New York University. The founders are worried that the lack of uniform admissions testing and the certificate system places too much control of college admissions with the high schools. Also, the certificate system is thought to be conducing students away from the northeastern colleges. The purpose of the Board is primarily to administer annual examinations in a variety of subjects thought to be important for college-level work. The members of the Board could then use the test scores however they chose. The fee for the test is expected to be $5 (about $136 in 2012 dollars). At this time, roughly 4% of high school graduates go on to college. 1901 The "College Boards" are administered in June for the first time to fewer than 1000 students. Roughly 75% of these students are applicants to Columbia University or Barnard College, hence the practical effect of these tests is to distinguish excellent students from elite students. The essay tests, which require five days to complete, are curriculum-based achievement exams, designed to assess a student's mastery of nine subjects, including Greek, Latin, and physics. For the price of ten cents, an examinee could find out from the College Board, before taking the test, the area of knowledge that each subject test would focus on. (For example, the student could learn that this year's Greek test would cover the first three books of Homer's Iliad.) Scoring is done by hand and consists of five ratings for each subject, from "Excellent" to "Very Poor", with "Doubtful" in the middle. 1917 An intelligence test developed by Robert Yerkes and other psychologists is administered to more than 1.5 million U.S. Army recruits. The test, called the Army "Alpha" exam, uses multiple-choice questions (invented two years prior) and is designed to help the Army make rapid placement decisions for prospective soldiers entering World War I. 1919 Columbia University begins allowing prospective students to substitute the results of an intelligence test (the Thorndike test for "Mental Alertness") for its regular entrance exams. 1925 By this time, about 20,000 prospective freshmen take the College Board's exams each year. However, this figure represents only about 10 percent of the number of students entering college in the U.S. Most colleges continue either to admit by certificate or use their own entrance exams. In April, the College Board appoints a commission, headed by Carl Brigham, to develop a new test designed to measure general intelligence. 1926 The first Scholastic Aptitude Test (or "SAT") is administered on June 23 to 8,040 students, 40% of whom are women. (About 85% of these students are taking the traditional boards as well.) Carl Brigham, a psychologist who helped to develop aptitude tests for the U.S. Army during World War I, is influential in the development of the 1926 test. The SAT is considered a "new psychological test" and a supplement to, but not a replacement of, the existing College Boards. Due to the completely different nature of the SAT compared to the boards, all students are required to take a practice test before the actual SAT (sample questions below). Five of the nine scored sub-tests of the first SAT are taken directly or with minor revisions from Brigham's 1925 "Princeton Psychological Examination", which itself was derived from the Army Alpha intelligence tests. Unlike the College Boards, the SAT (administered in June) is designed primarily to assess aptitude for learning rather than mastery of subjects already learned. For some college officials, an aptitude test, which is presumed to measure intelligence, is appealing since at this time intelligence and ethnic origin are thought to be connected, and therefore the results of such a test could be used to limit the admissions of particularly undesirable ethnicities. The test is designed to assess ability independently of any particular secondary school curriculum, which has a more mainstream appeal: college admissions testing via the SAT is uniformly applicable across a wide range of high school students, and the test is firmly in the control of college officials. The instructions for the test include the following: The pencil is preferable to the fountain pen for use in this sort of test. The test is comprised of nine sub-tests: two math tests (Arithmetical Problems, and Number Series), and seven verbal tests (Definitions, Classification, Artificial Language, Antonyms, Analogies, Logical Inference, and Paragraph Reading). 1) obedient; 2) sincere; 3) dissembling; 4) torpid. Which three of the following words are most closely related? 1) bean; 2) potato; 3) carrot; 4) beet; 5) lettuce; 6) cabbage. Five of the nine sub-tests of the 1926 SAT were minor revisions or verbatim versions of portions of Carl Brigham's test given to incoming freshmen at Princeton University in September, 1925. The test, officially called the "Princeton Psychological Examination", owed much of its content to the Army Alpha test and other contemporary intelligence examinations. Epilepsy is to carpenter as stuttering is to: 1) tongue; 2) minister; 3) cure; 4) stammering; 5) fluttering. Which two numbers come next in the sequence: 1/8, 1/8, 1/4, 3/4, 3, ?, ? A boat that can make forty miles an hour in still water makes a trip of one hundred miles down a certain stream. If this trip takes two hours, how long will the return trip take? Questions are from the 1926 SAT, form A1. Practice samples are from the 1926 SAT practice test. 1 Definitions 30 9 A minor revision of sub-test 1 of the 1925 Princeton Test. 2 Arithmetic 20 8 A minor revision of sub-test 7 of the 1925 Princeton Test. 3 Classification 40 6 Developed and standardized by C. L. Stone at Dartmouth College. 4 Artificial Language 20 9 A minor revision of sub-test 4 of the 1925 Princeton Test. Each question was worth from three to six points, for 74 points total. (practice) 50 10 A minor revision of sub-test 2 of the 1925 Princeton Test, which included both synonyms and antonyms. Two items in this sub-test were not scored. (practice) 25 9 Developed and standardized by C. L. Stone at Dartmouth College, this type of question was widely used in other tests, including the Army Alpha test 6. 7 Analogies 40 6 Except for question order, identical to sub-test 3 of the 1925 Princeton Test. (practice) 40 10 Developed by D. C. Rogers at Smith College. (practice) 50 30 Developed at Yale for the 1926 SAT and based on J. C. Chapman's work in elementary school tests. 10 Experimental Section 75 30 These questions were being tested for inclusion in future SATs and did not count toward the student's score. Raw scores on all of the sub-tests are combined into a single scaled SAT score ranging from 200 to 800. The raw scores are scaled so that the resulting average score is 500 and the standard deviation is 100. Using this scoring method means that an unusually strong group of students taking the test could push other students' scores down, unlike the modern SAT. Also, the scores in a particular year could not be compared with scores in another year. For example, a student obtaining a score of 600 in 1926 could be significantly weaker than a student obtaining a score of 600 in 1927, if the group of test takers in 1927 happened to be particularly good students overall compared to 1926. The first SAT is very hard for most students to finish: the scored portion of the test contains 315 questions to be completed in 97 minutes, or about 20 seconds to answer each one. (With 30 minutes for the experimental section and 22 total minutes of rest time between sub-tests, the total time of the test is about 2.5 hours.) On average, students taking the 1926 exam correctly answer only 173 questions. However, by 1929, the scored portion of the test will contain only six sub-tests and lasts 115 minutes (2 hours 40 minutes total with the experimental section and rest breaks). Subsequent changes to the test over the next 30 years will continue to make the verbal portion of the test less "speeded". By 1958, the scored portion of the SAT will be 2.5 hours in length, with a 30 minute experimental section, for a total time of 3 hours. 1928 The Artificial Language and Logical Inference sections are dropped from this year's SAT (never to appear again). Both math sections are removed from the test as well. In this year, juniors (students not expected to enter college until the following year) are allowed to take the SAT. This change results in 529 juniors taking the SAT in June out of roughly 8300 total test takers. 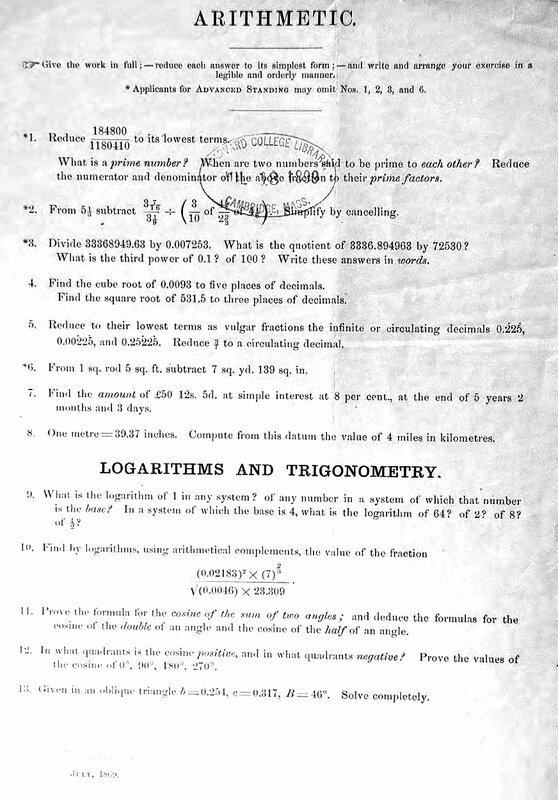 1930 Free-response math questions reappear for the 1930 test as a single sub-test; test takers are expected to solve 80 math questions in 100 minutes. Also, analogies are dropped from the verbal section, so that the verbal portion of the SAT at this time consists of only three sub-tests: antonyms, "double definitions", in which sentences are completed by filling in two blanks from a list of word choices, and paragraph reading. Previously, the scores for math sub-tests and verbal sub-tests were combined into a single final score. Starting in this year, a score on a 200 to 800 scale is reported separately for both "verbal aptitude" and "math aptitude". These scores are not sent to either the student or to his or her high school: only colleges and universities receive scores at this time. 1934 Eight years after rejecting the SAT for use in admissions, Harvard begins requiring all prospective scholarship students to take the SAT. The president of the university, James Conant, feels that the test provides an accurate assessment of a student's intelligence. (Conant reasons that the SAT could then be used by Harvard to select scholarship candidates from among students other than those from well-known East Coast private schools.) By 1938, all of the College Board member schools will be using the SAT to evaluate scholarship applicants. 1936 Math is once again removed from the SAT. (Math ability will be tested separately and independently on the experimental "Mathematics Attainment Test" from 1936 until 1941.) Analogies are returned to the verbal section. The rapidly increasing number of applicants to competitive graduate schools leads William Learned of the Carnegie Foundation and Ben Wood of the Cooperative Test Service to develop the Graduate Record Examination (GRE) for use in graduate school admissions. With Carl Brigham's and the College Board's support, the GRE incorporates the SAT as a portion of the new exam. The test is first used for 1457 applicants in October 1937 to the graduate schools of Columbia, Harvard, Princeton and Yale. Like the SAT at the time, the GRE is considered additional information for the admissions process and is provided on a voluntary basis by the applicant. 1937 The College Board's Achievement Tests (officially called "Scholarship Tests") are administered for the first time to about 2000 students in April. Each hour-long test is a multiple-choice format assessment of proficiency in single subjects such as biology, chemistry, Spanish, and social studies, among others. A student can choose to take one, two, or three of the tests; the exams are developed by the Cooperative Test Service and funded by the Carnegie Foundation. In conjunction with these subject tests, taken in the afternoon, the students take an SAT in the morning, making this SAT the first to be nationally administered in April. An April SAT date is appealing to colleges that want to notify applicants of their admission status earlier than late July, the earliest practical notification date with the June exams. The success of the Scholarship Tests will lead the College Board to offer an April SAT for admission purposes beginning in 1939. Secondary schools are given the SAT scores of their students for the first time starting in this year; whether or not students can learn their own test scores is up to the high school. 1938 The successful introduction of the GRE leads Ben Wood and William Learned, among others, to call for a national testing organization that could consolidate the activities of the various agencies developing standardized tests. The College Board decides not to participate (effectively quashing the idea), in part due to the viewpoint of Carl Brigham. Brigham (in a letter written to James Conant) says that "premature standardization" would result in the perpetuation of flawed tests and that sales or marketing concerns would come to dominate over the scientific desire to experiment with and improve the tests themselves. 1941 The verbal portion of the SAT in this year is curved to an average score of 500 with a standard deviation of 100. To make a score in one year comparable to a score in another year, all future verbal SAT scores will be linked to this reference curve, via a process called "equating". For example, a student obtaining a score of 600 in one year would be considered equivalent in ability to a student obtaining a score of 600 in any other year. The same reference curve will be used until March, 1995. One requirement of equating is the necessity of keeping the SAT content and question types generally the same from one year to the next going forward. A side effect of equating is that average SAT scores are no longer fixed to be 500. In December, administration of the original College Board examinations is suspended, and the exams are not used again. At this point, the SAT is the standard admissions test for almost all of the private colleges and universities in the northeastern United States. From this time forward, the SAT is entirely machine scored, using a technique that measures electrical conductivity in the marks made by pencils. 1942 Math returns to the SAT in April, in the form of multiple-choice questions with five-choice answers. To make a score in one year comparable to a score in another year, all SAT math scores on future exams will be linked to the curve used on the math section of this year's April exam. The same reference curve will be used until March, 1995. 1943 The College Board administers an SAT-like test to 316,000 high school seniors in order to find young men suited to technical jobs in the U.S. Navy. The single-day administration is larger than any prior one by a factor of 40. 1944 The G.I. bill for U.S. veterans of World War II is passed into law. Among other things, the law provides cash assistance to the veterans for college tuition and board. Over the next 12 years, more than two million veterans will use these benefits to attend colleges or universities. At the height of the program in 1947, veterans will account for 49 percent of college admissions. The large increase in prospective college students and the lack of a significant competitor in admissions testing will help lead to a factor of eight increase in SAT test-takers during the 1940s and an additional factor of ten increase during the 1950s. 1946 The SAT verbal section is changed to consist of antonyms, analogies, sentence completion, and reading comprehension, with somewhat less emphasis on "puzzle-like" reasoning questions and more emphasis on reading skills. This basic format will remain essentially the same for almost the next 60 years. The reading comprehension portions of the test are specifically considered to be "probably non-coachable". At this time, the SAT test fee is $5 (about $58 in 2012 dollars). Starting with the April SAT, the number of antonym questions on the verbal section is significantly reduced to make the test less "speeded" and to discourage vocabulary "cramming". 1951 The ETS, on behalf of the U.S. Selective Service System, administers an intelligence test to hundreds of thousands of college students. Those who score high enough will be deferred from the Korean war draft. Although there is some criticism of using such a test for draft deferment, the successful administration of the test establishes a favorable public perception of the ETS and puts it on solid financial ground. 1952 Antonym questions on the SAT are changed to multiple-choice form with five possible answers. At this time the SAT consists of five scored sections: two sections of five-choice math questions, and three sections consisting of analogies, antonyms, sentence completions, and reading comprehension questions. About half of the testing time allotted to the verbal section is devoted to reading questions at this point. The College Board begins to compute annual average SAT scores among all test takers at this time. 1954 A guessing penalty is instituted for the scoring of the SAT. Prior to this time, the instructions for the test stated that the test taker should "work steadily and as quickly as is consistent with accuracy". The instructions will now include: "In this test a percentage of the wrong answers will be subtracted from the number of right answers as a correction for haphazard guessing." 1958 The number of verbal questions on the SAT is reduced from 107 to 90. This change is the final step to move the SAT away from a test that was designed so that few students could finish. The scored portion of the test now consists of 150 questions and lasts 150 minutes, resulting in one minute alloted per question. Reading comprehension makes up about 40% of the test at this time. Students are allowed to view their own SAT scores for the first time. 1959 In the summer, the American College Testing (ACT) Program is founded by Ted McCarrel and E. F. Lindquist. Lindquist suggests that there is a need for a new regional or national test for college-bound high school students, for several reasons: 1) the SAT is used primarily by selective colleges in the northeastern U.S., but not by most public institutions as well as by universities in other regions of the country; 2) the new test should be used not just for admissions but placement as well; and, 3) the test should primarily be useful as an indicator of academic preparation, i.e., it should be an achievement test. From the first test on, ACT scores are reported directly to the students as well as to the colleges. According to the post-test booklet given to students along with their results, "these few digits, which represent your scores on ACT, may help you make decisions that will affect many aspects of your future." However, taking the ACT more than once is not allowed except under unusual circumstances such as physical illness during the exam administration. Given triangle PQR, can the size of angle P be determined? (2) The measure of angle Q is 40 degrees. E Statements (1) and (2) TOGETHER are NOT sufficient to answer the question and additional data specific to the problem are needed. The first Preliminary Scholastic Aptitude Test (PSAT) is administered in the fall of this year. The test is a shortened form of the SAT and is designed to help students become familiar with the question types and format of the full exam. At this time, the SAT test fee is $6 (about $47 in 2012 dollars). 1968 The number of students taking the ACT in the 1967-68 school year reaches about 950,000, more than seven times the number taking the test in 1959-60, the first ACT testing year. The University of California begins requiring applicants to submit SAT scores. (Scores will only be used for students whose high school GPAs are less than 3.1.) Previously, the university had used only high school track records to determine admission and had rejected the use of the SAT once before in 1960. However, by the mid 1960s, the post-World War II population boom made it necessary to reduce the size of the university's eligibility pool, and the SAT requirement was seen as the most effective way to do this. 1970 Starting this year, reported SAT scores are rounded to the nearest number divisible by ten. Previously, it was possible for students to receive scaled scores such as 501 or 789, for example. 1971 The National Merit Scholarship Corporation begins co-sponsoring the PSAT, which is now also called the National Merit Scholarship Qualification Test (NMSQT). Scores on the PSAT will be used to determine which students will receive recognition of scholarship and/or scholarship money. 1972 The College Board releases a report on a study done by ETS researchers to determine the effects, if any, of coaching on SAT math question types. The researchers found that a 21-hour course of coaching in 7 weeks "produces both statistically and practically significant score gains on each of the three mathematics aptitude item formats." The average effective score gains are "conservatively estimated at about 33 SAT-M [SAT Math] points." At this time, about 1 million students take the ACT each year. The test is administered five times per year (including a late July test date), and the test fee is $6 (about $32 in 2012 dollars). 1974 Beginning with the October test, several significant changes are made to the SAT. The number of reading comprehension questions is reduced to about 30% of the verbal portion of the SAT, in favor of more antonym and analogy questions. D if the relationship cannot be determined from the information given. The total time of the SAT verbal and math portions is reduced from 3 hours to 2.5 hours in order to accommodate the half-hour Test of Standard Written English (TSWE) that is newly added to the SAT. The TSWE is scored on a separate scale (20-60) and consists of multiple-choice questions designed to evaluate grammar and writing skills. The results of the TSWE are expected to be used by colleges for the appropriate placement of the test taker in freshman English class. 1975 The U.S. Federal Trade Commission (FTC) begins an investigation into the Kaplan Educational Center, a test preparation company. The FTC is investigating whether Kaplan is making false claims in its advertising. The Kaplan advertisements running in Boston say that, on average, Kaplan students raised their (combined verbal and math) SAT test scores by 100 points. The number of seniors taking the SAT increases to 996,452 students, which is about 32% of all graduating seniors at this time. The percent of seniors taking the SAT at least once will increase to 42% by 1993-94 and reach a peak of about 49% for the senior class of 2004-05. 1977 The number of dates on which SAT tests are administered nationally per year in the U.S. increases to six. 1978 The College Board begins including an entire sample SAT in its handbook (called "Taking The SAT") given to students. This particular sample test is the first complete SAT to be made public. The previous handbook (called "About The SAT") included sample questions, but not an entire test. At this time, the test fee for the SAT is $8 (about $28 in 2012 dollars). 1979 The FTC releases the final report of its investigation of the ETS, Kaplan, and other test preparation companies. The report suggests that coaching can improve SAT scores on average by 50 points (combined math and verbal). In a re-analysis of the FTC data, the ETS suggests that the result could be due in whole or part to the increased motivation and desire of students who choose to be coached, compared to those who do not. In July, New York State passes the Standardized Testing Act as part of the Admissions Testing Law, often called the "Truth-In-Testing" law. The law, to take effect in January, 1980, requires that students taking standardized tests in New York be allowed to see actual copies of any of their tests and answer sheets. In December, the ETS announces that copies of some previously administered SATs will be released to students nationally, on an ongoing basis. 1980 The College Board begins selling previously administered SAT tests directly to students, with the release of the booklet "4 SATs", to be followed by "5 SATs" in 1981 and "6 SATs" in 1982. In 1983, the College Board will begin regularly publishing tests in books, available nationally in book stores, called "5 SATs" and "10 SATs". To comply with the New York truth-in-testing law, the College Board reduces the total number of SAT administrations in that state from eight to four, and increases the SAT fee from $8.25 to $10 for New York students. Each student can receive a copy of the test with his or her answers and the correct answers, for an additional $4.65. The number of administrations of the GRE and ACT is also reduced in New York. In response to the truth-in-testing law, the AAMC decides to have no administrations of the MCAT in the state. However, by 1996, the law (New York Education Law, Title 1, Article 7-A, Section 342) will require only four SAT administrations per year to be disclosed. Similar exceptions will be made for the TOEFL and GRE tests, but not for the ACT test. The MCAT is also excepted and the AAMC is required to disclose only one test every four years. 1981 The College Board raises the math scores of nearly a quarter million students who took the PSAT administered in October, 1980. This PSAT is the first to be released to the test takers; a student notices that the ETS answer to one of the math questions (dealing with pyramids) is incorrect. In March, the College Board decides to provide all students nationally with copies of their SAT exams and answers, for at least some test administrations, for a fee of $9.25 (about $25 in 2012 dollars). The new policy will take effect in the 1981-82 testing year. 1985 In the summer, ACT publishes a 56-page student preparation handbook (titled "Preparing for the ACT Assessment") which includes a complete sample test for the first time. 1986 In the 1985-1986 school year, nine students out of about one million test takers (roughly one in 110,000 test-takers) receive a perfect score of 1600 on the SAT. 1987 The College Board begins its "New Possibilities Project", a multi-year endeavor to propose and study changes to the Board's testing program, including the SAT and the Achievement Tests. 1989 In October, a new version of the ACT (called the "Enhanced ACT") is administered, replacing the previous version of the test. Two major changes are made: the "Natural Science" sub-test of the ACT is replaced with a "Science Reasoning" sub-test, and the "Social Studies" sub-test is replaced with a "Reading" sub-test. The new reading sub-test is designed to be a better assessment of "pure" reading ability and comprehension, whereas the social studies sub-test contained items testing, among other things, specific knowledge of U.S. history. The new science sub-test de-emphasizes specific scientific knowledge while primarily assessing analytical and problem-solving skills using reading material, charts, graphs, and tables drawn from scientific literature. In addition, changes are made to the existing ACT mathematics and English sections. The math section will now include trigonometry as well as pre-algebra (arithmetic) content; the English section will place less emphasis on grammar and increase content related to testing of writing skills. The total time of the ACT test will increase from 2 hours and 40 minutes to 2 hours and 55 minutes. 1990 In this year, ten students out of 1.2 million test takers (roughly one in 120,000 students) get perfect scores of 1600 on the SAT. At this time, the test fee for the SAT is $16 (about $28 in 2012 dollars). In October, a report is released by a commission established by the College Board to review the proposed changes to be made to the SAT as part of the Board's "New Possibilities Project". The commission recommends that the SAT should: "do more than predict college grades", "reinforce the growth of sound high school curricula", and "approximate more closely the skills used in college and high school work". The commission also recommends that the acronym "SAT" used for the testing program be changed from "Scholastic Aptitude Test" to "Scholastic Assessment Test", in order to "convey a breadth sufficient to encompass the changes in format and purpose". The commission does not recommend adding a written essay to the SAT, as was expected, but instead advises that a mandatory essay be made part of a new writing Achievement test (to be called "SAT II - Writing"). 1993 The SAT is renamed from "Scholastic Aptitude Test" to "SAT I: Reasoning Test", and the Achievement Tests are renamed "SAT II: Subject Tests". The first renamed tests will be administered in March, 1994. Collectively, according to the College Board, these tests are to be known as "Scholastic Assessment Tests" (plural), and the acronym "SAT" is no longer considered to stand for anything. Donald M. Stewart, the president of the College Board, says that the renaming is designed "to correct the impression among some people that the SAT measures something that is innate and impervious to change regardless of effort or instruction." However, for at least the next three years, the Reasoning Test is commonly called the "Scholastic Assessment Test" (singular), and Stewart himself will use this phrase to refer to the SAT in a letter to the New York Times in 1995. 1994 Significant changes are made to the SAT starting with the March test. Antonyms are removed from the verbal section to make rote memorization of vocabulary less useful. (For a list of the antonym words used in 45 SAT tests from 1977 to 1990, see this PDF file.) The percent of content devoted to passage-based reading material is increased from about 30% to about 50%, and the reading comprehension sub-sections are renamed "Critical Reading". The reading passages are chosen to be more like typical college-level reading material, compared to previous SAT reading passages. The TSWE is dropped from the SAT at this time; this test reappears as part of the SAT II Writing Test, which also includes a short essay. The time allocated to the math and verbal portions increases by 15 minutes each, keeping the SAT three hours in length and decreasing the impact of speed on test performance. Three major changes are made to the math section of the SAT: the tested math content is expanded, free-response questions are added, and students are now allowed to use calculators. These changes are made in response to the suggestions of the NCTM, which in an influential 1989 report had emphasized the use of the "real-world" problems, probability and statistics, and calculators in the K-12 math curriculum. At this time, the tested math material is expanded to include: questions with more than one correct answer (via the free-response section); data interpretation, including pie charts, bar graphs, and scatterplots; slopes of lines; probability; the concepts of median and mode; logic problems; and, counting and ordering problems. (For all of the yearly average SAT scores from 1952 to the present, including SAT scores on the original (pre-1995) scale, see this PDF file for the data and this PDF file for a plot.) The recentering is done in order to return the average scores of the verbal and math sections closer to each other and closer to the midpoint of the scale (500), as seen in the last line of the table above. Although new scores will still be reported on the same 200-800 scale, the recentering means that the old test scores (prior to April 1995) will not be directly comparable to later scores. For example, a May 1995 score of 600 in math will not reflect the same ability level as a May 1994 score of 600 in math. The primary problem with the pre-1995 scale is that test scores are still linked to the 1941 and 1942 reference groups of students, and the test-taking population changed significantly in the decades after World War II. Mathematically, this meant that it was not unusual, especially for verbal section scales, to have a perfect raw score correspond to a scaled score of less than 800. (The scoring policy, however, was to award an 800 for a perfect raw score.) A group of about one million seniors in the class of 1990 is chosen to be the reference group for the new scale. Another effect of the recentering of SAT scores is a significant increase in the number of students achieving a perfect score of 1600. Previous to the new scaling, a single mistake or question left blank would result in a score of less than 1600. Starting with the April, 1995, SAT test, students can miss as many as four questions and still get a perfect 1600. In 1994, 25 students got perfect scores out of about 1.25 million (about 1 in 50,000 students). The first recentered SAT in April has 137 perfect scores out of about 200,000 test takers (about 1 in 1,400 students). 1996 In September, the ACT (both the test and the company) is renamed so that "ACT" is no longer an acronym: the letters "ACT" no longer stand for anything. Starting in October, calculators are allowed for use by students on the math section of the ACT test. 1997 The College Board, in an attempt to clear up confusion about the naming of the SAT, says that the SAT by itself is not properly called the "Scholastic Assessment Test". Instead, the term "SAT" is not to be considered an acronym: the letters "SAT" no longer stand for anything. Online registration for the ACT test via the Internet is made available. 1999 At this time, the test fee for the SAT is $23 (about $31 in 2012 dollars). Below is the list of states that require all high-school juniors to take either the SAT or ACT test. Key: red text is for the ACT only, blue text is for the SAT only, purple text is for either test, and "+" or "-" means that the state added or dropped the test, respectively. For a visual depiction of the data, see the chart. Concerned that the SAT is not nearly as good a predictor of college success as either high-school grades or the SAT II Subject Tests, the president of the University of California suggests dropping the SAT I as a consideration in UC admissions. Criticisms of the SAT at this time also include the apparent disconnection between what high-school students are learning in their course work and "esoteric" items on the SAT such as verbal analogies and quantitative comparison questions. 2002 Beginning with the October test date, "Score Choice" for the SAT II Subject Tests is dropped. Previously (since 1993), a student could decide whether a Subject Test score would be sent to a college or university. After the change, all scores of any tests taken are sent, matching the policy of the SAT I. The College Board awards Pearson Educational Measurement with a contract to scan answer sheets and grade the essay on the new SAT (announced in 2002). The Pearson contract, along with the new SAT, will begin in 2005. 2004 The SAT is again renamed, dropping the roman numerals, so that the official names are "SAT Reasoning Test" and the "SAT Subject Tests". 2005 Beginning with the March SAT, the content of the test is changed, at least partly in response to the UC criticisms. The "Verbal Reasoning" section of the SAT is renamed "Critical Reading", and the verbal analogy questions are dropped. The new reading section includes short passages (fewer than 20 lines) as well as the traditional longer reading selections. Newly added is a writing skills section, with essay, based on the now discontinued SAT Subject Writing Test. Three SAT scores, for Critical Reading, Math, and Writing, each on a scale of 200-800, are reported, making the perfect score 2400 instead of 1600. In SAT Math, quantitative comparison questions are dropped. Several new topics are added: exponential growth; absolute value; functional notation; equations of lines; rational and radical equations; and, manipulation of fractional and negative exponents. (The rational and radical equations as well as the fractional and negative exponents are added to reflect content from typical third-year high-school algebra courses.) Greater emphasis is placed on linear functions, and properties of tangent lines. About 300,000 students take the first "new" SAT in March, with 107 of them (roughly 1 in 2,800 students) receiving a perfect score of 2400. The ACT test adds a 30-minute writing section, beginning with the February administration; the section is optional for test takers. With the writing section, the total time of the ACT test increases to 3 hours and 25 minutes. 2006 In March, the College Board announces that about 5,000 of the half-million SAT tests taken in October 2005 were incorrectly scored. (Most of the errors resulted in reported scores lower than what students actually scored.) The testing company that scores the exams, Pearson Educational Measurement, says that the errors were due in part to excessive moisture when the answers sheets were scanned. Out of 1.38 million seniors taking the SAT, 238 (roughly 1 in 5,000 students) receive a perfect score of 2400. In 2004, approximately the same number of seniors took the SAT, and 939 (about 1 in 1,500 students) received a perfect score of 1600. In comparison, 216 seniors in the class of 2006 out of 1.21 million taking the ACT (about 1 in 5,600 students) receive a perfect composite score of 36. 2007 The ACT becomes a valid admissions test at every four-year college or university in the U.S. when Harvey Mudd College accepts ACT scores for fall admissions. 2009 "Score Choice" for the SAT is returned, beginning with the March test date. Under this policy, students are allowed to report any or all of the SAT or SAT Subject Tests that they take, depending on the admissions criteria of the recipient colleges. (However, the honor system is used: no verification is made by the College Board that a student reports all scores to a college that has an "all scores" policy.) Previously, all SAT and SAT Subject scores would be reported. In December, the College Board stops selling unused test booklets from prior PSAT administrations. Previously, the booklets were available directly from the College Board store for $3 each. 2011 The College Board revises its SAT statistics to include those seniors taking the test as late as June of their graduation year, as opposed to March, the previous cutoff date. This change has the effect of both reducing mean SAT scores and increasing the number of seniors included in the statistics. * Includes seniors taking the SAT as late as June of their senior year. For the first time since 1963, an SAT is scheduled to be administered in August. The test administration is to be available only to people enrolled in a test preparation program for gifted students at Amherst College. However, the College Board later cancels the August test date, calling it "inappropriate". Starting with the October tests, new security measures intended to reduce cheating are put into place for the SAT and ACT. Students are now required to submit a photo and high school code when registering for an exam. The high school will receive the scores for each student and will be provided access to the student's submitted photo for verification purposes. In May, ACT Inc. announces that a computer-based version of the ACT test will be made available starting in the spring of 2015 for schools that administer the ACT during the school day. The new version will retain the same content as the paper version of the test, which will remain available for the time being. The computer tests, to be administered via the Internet, will optionally include questions requiring the student to produce his or her own answers, along with the traditional multiple-choice items. Starting with the graduating class of 2013, ACT Inc. begins including both standard-time and extended-time test takers in its annual report. This change has the effect of both reducing mean ACT scores and increasing the number of seniors included in the statistics. More than fifty percent of graduating seniors taking either the SAT or ACT are now taking the ACT test. * Includes both standard-time and extended-time seniors taking the ACT. In December, the College Board announces that the revised SAT will appear in the spring of 2016, one year later than expected. The correspondingly revised PSAT is scheduled for October, 2015. 2014 In March, some details of the upcoming changes to the SAT are revealed. The essay is to be made optional and scored separately, reverting the maximum combined score back to 1600; the guessing penalty will be eliminated; calculators will no longer be allowed for some of the math sections; the range of math content areas will be reduced; each test will include a reading passage "drawn from the Founding Documents or the Great Global Conversation"; some reading passages on each test will be accompanied by tables or graphs; and, the SAT will be available in both paper-and-pencil form as well as on a computer. In June, ACT Inc. announces changes to the ACT test which are to go into effect sometime in 2015. Students will receive new scores or "indicators", along with the usual individual and composite scores, describing performance in categories such STEM, career readiness, English language arts, and text complexity. In addition, the optional writing portion of the test is increased in duration from 30 minutes to 40 minutes. The new essay prompt includes three different perspectives on an issue which the student is asked to evaluate and compare with his or her own perspective. 2016 In February, the College Board publishes upcoming test dates for the next three years, effectively announcing that a nationwide summer SAT test administration will be provided, beginning in the August just prior to the 2017-2018 school year. (The last August tests to be administered were in the early 1960s.) The August test is to replace the January administration. In March, the redesigned version of the SAT is administered, with approximately 280,000 test takers registered to take the Saturday exam. In March, ACT Inc. announces the PreACT test, a competitor to the College Board's PSAT. The PreACT, available starting in the fall, is designed to be given to 10th graders in the United States as practice for the ACT. The test is paper-based, runs about two hours long (compared to at least three hours for the ACT), and can administered by schools at any time during the school year. 2019 In March, U.S. federal prosecutors charge fifty people in a scheme to fraudulently obtain admissions offers from multiple American colleges and universities. The government says that, in some cases, SAT and ACT scores were falsified via the use of bribed test administrators who would provide correct answers or correct students' submitted answers in order to improve their test scores. In addition, according to the prosecutors, fraudulent claims of learning disabilities were made in order to gain extra allotted time for students as well as to obtain easier access to the two test centers in which the bribed administrators were located. This content is licensed under a Creative Commons Attribution-ShareAlike 4.0 International License. Please feel free to improve, share, and make copies of this content, as long as you use the same, similar, or compatible license. In any case, please leave in an attribution to me (Erik Jacobsen) and to erikthered.com. SAT and ACT are registered trademarks of the College Entrance Examination Board and ACT, Inc., respectively. Answer to the 1926 math questions: sequence - 15 and 90; boat - 3 hours, 20 minutes. Answer to the data sufficiency question: C. Answer to the quantitative comparison question: C.
This history is too SAT oriented. I need a little more ACT-bell! "Plan of Organization for the College Entrance Examination Board of the Middle States and Maryland", 1900. "Twenty-Eighth Annual Report of the Secretary of the College Entrance Examination Board", College Entrance Examination Board, 1928. "A Study Of Error", Carl C. Brigham, College Entrance Examination Board, 1932. "The College Board - Its First Fifty Years", Claude Fuess, Columbia University Press, 1950. "A History of the Content of the Scholastic Aptitude Test", Peter G. Loret, Test Development Memorandum 60-1, Educational Testing Service, 1960. "ACT Student's Booklet", American College Testing Program, 1959. "The College Board Admissions Testing Program: A Technical Report on Research and Development Activities Relating to the Scholastic Aptitude Test and Achievement Tests", William Angoff, ed., College Entrance Examination Board, 1971. "The Effects of Special Instruction for Three Kinds of Mathematics Aptitude Items", Lewis W. Pike and Franklin R. Evans, ETS, 1972. "College-Bound Seniors, 1973-74", College Entrance Examination Board, 1974. "College-Bound Seniors, 1974-75", College Entrance Examination Board, 1975. "The First 75 years: The College Board 1900-1975: A Historical Perspective", College Entrance Examination Board, 1975. "On Further Examination: Report of the Advisory Panel on the Scholastic Aptitude Test Score Decline", College Entrance Examination Board, 1977. "Short-Term Instruction, Testwiseness, and the Scholastic Aptitude Test", Lewis W. Pike, ETS, 1979. "Effects Of Coaching On Standardized Admission Examinations (Revised Analysis)", Federal Trade Commission, 1979. "Q. & A. on 'Truth in Testing'", Dan Hulbert, The New York Times, January 6, 1980. "The Effectiveness of Coaching for the SAT: Review and Reanalysis of Research from the Fifties to the FTC", Samuel Messick, ETS, 1980. "Youth Outwits Merit Exam, Raising 240,000 Scores", Edward B. Fiske, The New York Times, March 17, 1981. "'Truth In Testing' To Be Nationwide", Edward B. Fiske, The New York Times, March 27, 1981. "Student Characteristics And The Use Of SAT Test Disclosure Materials", College Entrance Examination Board, 1982. "No Mistake, These Five Kids Have All the Answers: They Scored Perfect 1600s on Their SAT Exams", Michael Small, People Magazine, June 8, 1987. "The Scholastic Aptitude Test: Its Development and Introduction, 1900-1948", David R. Hubin, Ph.D. Dissertation, University of Oregon, 1988. "The College Board Achievement Tests", Revised Edition, College Entrance Examination Board, 1990. "Beyond Prediction", Commission on New Possibilities for the Admissions Testing Program, College Entrance Examination Board, 1990. "Revisions Adopted in College Entrance Tests", Anthony DePalma, The New York Times, November 1, 1990. "S.A.T. Revisions Will Be Included in Spring '94 Test", Mark Pitsch, Education Week, November 7, 1990. "Picture-Perfect Score for Teen: A 1600 on SAT", Greg Hernandez, Los Angeles Times, January 31, 1991. "The SAT: Four Major Modifications of the 1970-85 Era", John R. Valley, College Entrance Examination Board, 1992. "SAT Changes Name, But It Won't Score 1,600 With Critics", Mary Jordan, Washington Post, March 27, 1993. "Testing Testing: Social Consequences of the Examined Life", F. Allan Hanson, University of California Press, 1993. "Women, Minorities, and Persons With Disabilities in Science and Engineering", Chapter 3, NSF report 94-333, 1994. "Revised and Renamed, S.A.T. Brings Same Old Anxiety", William H. Honan, The New York Times, March 20, 1994. "When Close Is Perfect: Even 4 Errors Can't Prevent Top Score on New S.A.T. ", James Barron, The New York Times, July 26, 1995. "Revised PSAT Debuts In October", The National Center for Fair & Open Testing, 1997. "Insisting It's Nothing, Creator Says SAT, Not S.A.T. ", Peter Applebome, The New York Times, April 2, 1997. "The Big Test: The Secret History of the American Meritocracy", Nicholas Lemann, Farrar, Straus, and Giroux, 1999. "Secrets of the SAT", PBS Frontline, 1999. "A Faithful Mirror", College Entrance Examination Board, 2001. "Test Pilot: How I Broke Testing Barriers for Millions of Students and Caused a Sonic Boom in the Business of Education", Stanley H. Kaplan, Simon and Schuster, 2001. "The Recentering of SAT Scales and Its Effect on Score Distributions and Score Interpretations", College Entrance Examination Board, 2002. "The Use of Admissions Tests by the University of California", Board of Admissions and Relations with Schools of the University of California's Academic Senate (BOARS), 2002. "Students Protest Plan To Change Test Policy", Yilu Zhao, The New York Times, June 19, 2002. "A Historical Perspective on the Content of the SAT", College Entrance Examination Board, 2003. "The Math Section on the New SAT", College Entrance Examination Board, 2004. "SAT Errors Raise New Qualms About Testing", Karen W. Arenson, The New York Times, March 10, 2006. "The ACT Technical Manual", ACT Inc., 2007. "SAT Changes Policy, Opening Rift With Colleges", Sara Rimer, The New York Times, December 30, 2008. "ACT: The First Fifty Years, 1959-2009", ACT Inc., 2009. "Reflections on a Century of College Admissions Tests", Atkinson and Geiser, 2009. "The GI BILL's History", U.S. Dept. Of Veterans Affairs, 2010. "Digest of Education Statistics: 2012", U.S. Dept. Of Education / Institute of Education Sciences, 2012. "SAT Exam To Be Redesigned", Valerie Strauss, The Washington Post, February 26, 2013. "ACT to Move Toward Computer-Based Testing", Tamar Lewin, The New York Times, May 6, 2013. "ACT Profile Report - National", ACT, Inc., 2013. "Major Changes in SAT Announced by College Board", Tamar Lewin, The New York Times, March 6, 2014. "Test-Prep Companies Barred From SAT Debut", Catherine Gewertz, Education Week, March 9, 2016. "'Massive' breach exposes hundreds of questions for upcoming SAT exams", Renee Dudley, Reuters, August 3, 2016. "Test Security and Fairness", College Board, 2016. "ACT to Offer New ACT Test Date in Summer", ACT, Inc. 2017. "Actresses, Business Leaders and Other Wealthy Parents Charged in U.S. College Entry Fraud", Jennifer Medina, Katie Benner and Kate Taylor, The New York Times, March 12, 2019. "Donald M. Stewart [Obituary], 80, President of College Board", Sam Roberts, The New York Times, April 13, 2019.